At least where I live in New England, tomatoes are not yet ripe (we’re still hoping it stops raining! 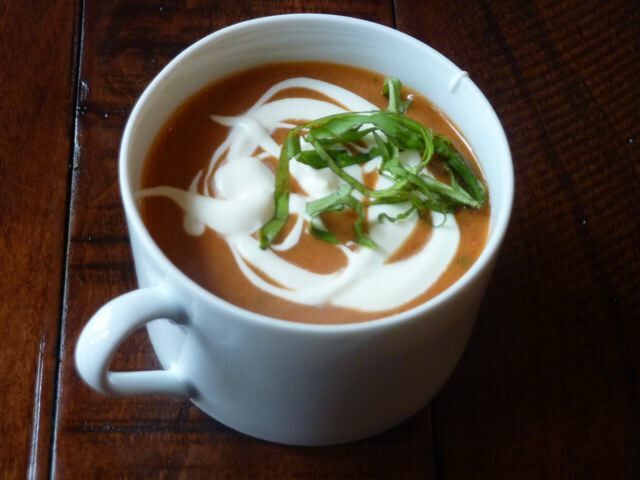 ), but it’s not too soon for much of the country to post this super easy, super delish, cold tomato soup. Yup. Cold as in chilled. And no cooking whatsoever. You may be familiar with hot tomato soup, specifically the famous soup sold in red and white cans from coast to coast, but if you haven’t tried the real thing, refreshingly cold, here’s your opportunity. Make this when the tomatoes are at their best in the markets or on the vine. The soup requires zero cooking and so could not be easier. Just let the ingredients mellow in the refrigerator for a number of hours so that the juices exude from the tomatoes, and then zap everything in a blender. Done! If you have access to heirloom tomatoes, all the better. It’s one of my all-time summer favorites. Put the tomatoes, oil, vinegar, about 10 basil leaves, 2 teaspoons of salt, and garlic in a large glass, ceramic, or other nonreactive bowl. Stir gently, cover, and refrigerate for at least 6 hours and up to 10 hours or overnight. Process the soup in a blender in batches. Taste and adjust the seasoning with basil, salt, and pepper. Garnish each serving with a swirl of crème frâiche, if desired, and the remaining fresh basil leaves.